The Karen I. Fryberg Tulalip Health Clinic, in Tulalip, Wash., implemented the Midmark-Versus patient flow optimization solution to reduce patient wait times, enhance communications and improve the patient experience. The newly renovated Tulalip Health Clinic implemented Midmark-Versus RTLS to reduce wait times, improve the patient experience and increase provider efficiency. 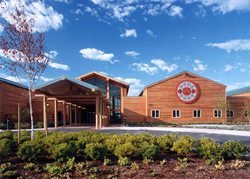 Located 30 miles north of Seattle, Tulalip Health Clinic serves the Tulalip Reservation, a federally-recognized organization of Snohomish, Snoqualmie, Skagit, Suiattle, Samish and Stillaguamish tribes. The newly renovated 26,500 square foot facility clinic treats more than 150 patients each day, offering a broad range of services including family practice, acute care, internal medicine, pediatrics, dental, podiatry and behavioral health. The clinic also offers an on-site laboratory, digital imaging and pharmacy services. An integration with Tulalip’s Epic EMR displays appointment times, provider names and relevant patient information on Midmark-Versus Glance-and-Go™ electronic whiteboards. Together with patient location and visit status, this allows staff to make in-the-moment adjustments to accommodate fluctuating patient volumes from nonscheduled walk-in cases. Room utilization and patient flow reports, as well as real-time patient flow information, require highly accurate location data. In a 2016 report from the healthcare research firm KLAS, Versus received the highest rating among RTLS vendors that provide both hardware and software. Versus also received the highest rating for location accuracy, as well as for many other categories.1 For more on the KLAS report, visit versustech.com/KLAS. Midmark Corporation acquired Versus Technology, Inc. in May, 2016, creating a unique offering of clinical workflow solutions that encompass clinical workflow services, RTLS technology, medical equipment, diagnostic devices and design assistance for improved efficiency within health systems. 1 Source: “Real-time Location Systems (RTLS) 2016,” July 2016. © 2016 KLAS Enterprises, LLC. All rights reserved. http://www.KLASresearch.com. The Tulalip (pronounced Tuh’-lay-lup) Tribes, successors in interest to the Snohomish, Snoqualmie, Skykomish, and other allied tribes and bands signatory to the 1855 Treaty of Point Elliott. Our tribal population is over 4,500 and growing, with 2,500 members residing on the 22,000 acre Tulalip Indian Reservation located north of Everett and the Snohomish River and west of Marysville, Washington. Tribal government provides membership with health and dental clinics, family and senior housing, human services, utilities, cultural activities, schools, childcare, and higher education assistance. The Tulalip Tribes maintain extensive environmental preservation and restoration programs, both on and off the Reservation, to protect the Snohomish region’s natural resources that include marine waters, tidelands, fresh water rivers and lakes, wetlands, and forests. Developable land and an economic development zone along the I-5 corridor provide revenue and services for these efforts. This economic development is managed through Quil Ceda Village, the first tribally chartered city in the United States, providing significant contributions back to the community and environment that benefit the entire region. The governing body is the seven-member Tulalip Board of Directors. For more information, visit http://www.tulaliptribes-nsn.gov. Versus Technology, Inc., a Midmark company, provides healthcare facilities with operational and clinical workflow intelligence using real-time locating system (RTLS) technology. Since its inception in 1988, more than 850 hospitals, clinics and senior care facilities have used Versus solutions to support healthcare’s ultimate goals: enhancing the patient experience while providing high-quality care at lower costs. With enterprise solutions for patient locating, workflow automation, staff safety, hand hygiene and asset tracking, Versus improves patient flow, communication, and productivity to ultimately increase capacity. To learn more about Versus Technology, Inc., our technology and client successes, visit versustech.com. Midmark Corporation, a privately held company, founded in 1915, is a leading provider of medical, dental and veterinary equipment and technologies. Our more than 1,800 teammates worldwide are passionate and courageous leaders focused on making a positive difference in the lives we touch by improving the experience between patients and their caregivers. Headquartered in Dayton, Ohio, Midmark maintains production and administrative offices in Versailles, Ohio. Midmark has six other locations in the United States as well as a number of subsidiaries in the United States, including Midmark RTLS Solutions. Midmark also maintains international subsidiaries in India and Italy. To learn more about Midmark, visit midmark.com.